They have been concerned to confirm the shipping address and has been immediate. All perfect. Sewithd hand and used tires, safety and security for your motorcycle at the best price. Shipments to all the world. Set of Bridgestone tires Michelin Anakee 3 measures 110/80 and 150/70. Set of Bridgestone tires Battlax BT023 measures 120/70 and 160/60. 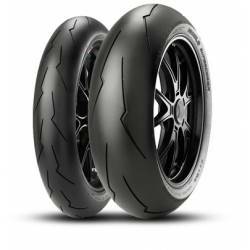 Set of Bridgestone tires Battlax S20 Evo measures 120 and 180. Set of Michelin tires Pilot Power 2CT measures 120 and 180. Set of Bridgestone tires PIRELLI SUPERCORSA SC V2 measures 120/70 SC1 and 180/55 SC2. Set of Bridgestone tires PIRELLI SUPERCORSA SC V2 measures 120/70 SC2 and 180/55 SC2. 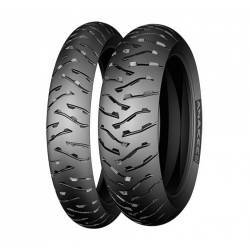 Set of Bridgestone tires Battlax BT016 PRO measures 120/70 and 180/55. Set of Bridgestone tires Battlax BT023 measures 120/70 and 180/55. Set of Bridgestone tires Battlax R10 measures 120/70-17 and 180/55-17. 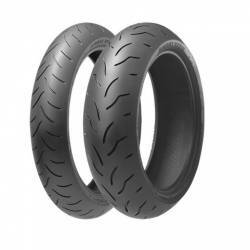 Set of Bridgestone tires Battlax R11 measures 120/70-17 and 180/55-17. Set of Bridgestone tires Battlax RS10 measures 120/70-17 and 180/55-17. Set of Bridgestone tires Battlax S21 measures 120/70-17 and 180/55-17. Choose the right tire for your motorcycle based on the width, profile, radius and charge and velocity codes. 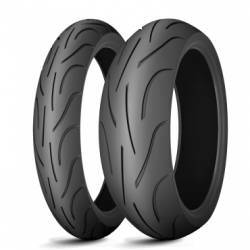 We offer you tires for Scooters, Mopeds, Motorcycles and Trial/Field Motorcycles. Among the features of the tire, you'll also find the fabrication date, indicating the week and year and if it is new or used. Don't forget that all this information can be found in the 'More info' section from every tire. 1) New and unused tires. 2) New and unused tires with a fabrication date 5 or more years old. Our new tires come from official distributors (Pirelli, Michelín, Metzeler, Dunlop, Bridgestone...), and they are not bought to third parts. That way we ensure that our tires keep all their features, since we store them correctly. Those tires are less than 5 years old, so they keep almost a 100% of their efficiency and grip properties. In that case, the tires have the same properties as the ones explained above, but their fabrication date is 5 years old or more. That's the reason why they have a discount in their price. According to most of the manufacturers, those tires may be used in our motorcycles without any problem, but they don't keep the 100% of their efficiency and grip, specially the hi-performance tires or those for adverse weather conditions. It is essential, particularly for those kinds of tires, that its storage has been done with good light and humidity conditions, which are some of the main reasons for the rubber deterioration. We have a specific storage facility where we storage those tires without any contact with the outside or other parts. 1) The outside look shows that the tire keeps more than a 50% from its useful life. 2) The picture is still in good shape and doesn't have any crack or flaw. It has to keep the usage controls untouched. 3) It's less than 10 years old, since the manufacturer doesn¡t recommend driving with tires that are older than that. We like to ensure our tires quality and, considering that we can't know for sure when the tires were assembled, we use its fabrication date.